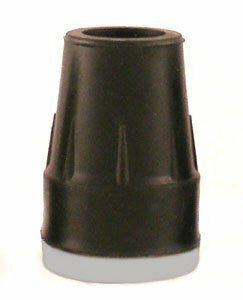 Thomas Fetterman Tornado Cane Tips with Wet-Slip Tread, Small 1/2 inch diameter, Black, Pair: Thomas Fetterman tornado Cane Tips with patented highly wet-slip resistant tread can greatly reduce slipping especially on wet surfaces. I have noticed over the years that there are far more cane users than crutch users. I have talked with many of them and they have the same problem with wet smooth surfaces as I do using my crutches. Many serious cane users swear by our Tornado Gel Rain Tip but most cane users prefer a smaller tip. So, in an effort to "share the love" I have developed three smaller sized cane tips that all have our highly wet-slip resistant tread adhered to the bottom for greatly enhanced safety. Our new durable Tornado Cane Tip tread was scientifically developed and tested using the English Wet-Slip Testing Machine. Repeated tests have demonstrated that Tornado Cane Tips are over 300% more wet-slip resistant than all other cane tips tested. While this tip is not completely "slip-proof" it can greatly reduce slipping on hazardous wet surfaces. If it prevents just one fall...isn't it worth it? These Tornado Cane Tips fit cane shafts that are 1/2" diameter and are sold in pairs. Note: Be sure to measure the diameter of your cane shaft with the tip removed. If you have any questions about this product by Thomas Fetterman, contact us by completing and submitting the form below. If you are looking for a specif part number, please include it with your message.